Missed the 2014 FIASI Hall of Fame ceremony and dinner? Interested to hear from the awardees or see who was there? Watch the video below. I am honored and delighted to be here tonight. It's been a true pleasure to see so many people who have meant so much to me during my career, some whom I haven't seen for many years. I want to congratulate the other honorees, Professor Markowitz and Curtis Arledge. Professor Markowitz, every person in this room has benefited from your pioneering work on modern portfolio theory (MPT) and has been a student of MPT. There is no one who has contributed more to the thought leadership of portfolio research; you have set the bar high for all of us in the field. Curtis, you have a reputation and track record as a true intellectual with a passion for understanding the details and drivers of markets. I am humbled to be recognized with tonight’s highly accomplished honorees. I am grateful to Mark Howard, the Hall of Fame Chair, and to other members of the Fixed Income Analyst Society (FIASI), particularly Chris Buck and Peter Petas, for this tremendous honor. To be in the same company as the members of the Hall of Fame, whom I have long admired, is something that I will always treasure. And thank you to J.P. Morgan, where I have worked for the past 15 years. I am fortunate to work with the best researchers in the industry who inspire me, challenge me and amaze me every day. A special shout out to the woman's fixed income research table from J.P. Morgan and to all of the researchers at J.P. Morgan. This is a team that motivates me to become better professionally and personally every day – plus they are a lot of fun to work with. I am truly surprised to be here tonight. In 1990, the year that Professor Markowitz shared the Nobel Prize in economics for his work on portfolio theory, I was still trying to figure out my life as a graduate student. I had always had a passion for emerging markets and knew that this was where my career would take me, but I had never worked in the private sector, much less an investment bank. My career plans were squarely focused on public policy. During my last semester at Princeton, Salomon Brothers called up the career services office to see if there were any grad students working on what was then called "third world" or LDC (less developed countries) because they wanted a part-time intern. No one thought this would be a full-time job so they only needed someone two days a week, paying by the hour. I was lucky to arrive at Salomon Brothers at an extraordinary time and am grateful to see one of my first mentors and role models here tonight, Marty Leibowitz, who ran the research department at Salomon Brothers back when I started in the industry. Marty and others at Salomon taught me fixed income, how to take and analyze risk and how to come up with a clear view, while developing the first analytics around emerging markets bonds. I am still in touch with my managers from Salomon Brothers as they have almost all stayed in fixed income markets long after the Salomon Brothers name has disappeared. The Salomon LDC desk was a small niche within the corporate bond business back in the early 1990s. At the time, most Emerging Markets debt consisted of non-performing loans trading at a deep discount. Sovereign risk analysis was considered writing about the Quebec referendum or explaining AAA-rated World Bank bonds to insurance companies. Loans, not bonds, were in circulation for emerging markets and the business was dominated by commercial banks. Information was very scarce, with countries reporting data erratically. Given the state of the market, Salomon Brothers back then had a brilliant and early call on emerging markets as an investment opportunity. As an investment bank, they had not been one of the original commercial bank lenders and suffered no losses. The traders were in the position to bid on the distressed, non-performing commercial bank debt that was trading at a deep, deep discount, The early packages that I analyzed traded at 10 to 15 cents on the dollar for Latin commercial bank loans. I remember traveling to Peru when the debt traded at 2 cents on the dollar. The Shining Path made the country ungovernable and hyperinflation was above 10,000%. US banks wanted to write off their debt and move on from the debt crises of the 1980s, offering the African debt of Côte d'Ivoire and Nigeria for free if Salomon bought the Latin paper. The fortunes for emerging markets changed when the Brady plan was launched in the early 1990s and US Treasuries were used to collateralize the defaulted debt so that countries could begin the long process of coming back to the international capital markets. At Salomon Brothers, I was proud to create some of the first primers looking at Emerging Markets fixed income as an asset class. The Brady bonds were given totally appalling and completely unmarketable names like the Brazil IDUs, which stood for Interest Due and Unpaid. Who would possibly want to invest in a bond called Interest Due and Unpaid? No one would ever have thought that 25 years later, Emerging Markets debt would be investment grade with a debt level that is less than one-third the size of developed markets, and that the EM corporate bond market would be the same size as the US high yield market. The size of the Mexico bailout in 1994 was small change at $50 bn in loans and guarantees compared to the size of the TARP program alone at $700 bn. Nor would I ever have imagined that 25 years later I would have the opportunity to some day run one of the biggest research departments on Wall Street, working with so many talented research professionals around the globe. Although he isn’t here tonight since he is based in London with the herculean job of running the whole investment bank, I have to express enormous gratitude to Daniel Pinto, who runs the Corporate and Investment Bank at JPMorgan Chase, for his long-time mentorship during the course of my career at JPMorgan, and most importantly for his sponsorship of independent, global and comprehensive research at JPMorgan that is deeply committed to serving our clients. Since the global financial crisis, experience in analyzing emerging markets crises and bank bailout packages has been arguably the best foundation a research analyst could have for assessing the fallout from both the US and Eurozone financial crises. Emerging Markets analysts were the first to know that Greece wouldn’t be different. All of those years spent analyzing emerging markets crises and bank bailout packages -- looking at the links between the two --- came in handy. The recent crises were reminiscent of emerging markets with respect to understanding the outsized role that politics and public opinion plays in addressing a crisis when public resources are involved. These days, it’s harder and harder to separate the line between Emerging Markets and Developed Markets. It’s all converged to triple-B rated. You name it: It’s triple-B rated. Mexico, India, Russia, Brazil, Italy, Spain, Ireland, Verizon, and many of the largest US and European banks, as well as Puerto Rico before it was downgraded earlier this year. We are investing in a “new normal,” where many credits have converged to one notch above junk in a world that is below potential growth, offering lower expected returns. What are J.P. Morgan’s global fixed income research teams focusing on now? Over the past year, our global fixed income research teams have spear-headed research challenging the market conventional wisdom that there would be a “Great Rotation” out of bonds into equities. We have focused on how the global financial crisis has changed the structure of the fixed income market and the lingering effects of financial repression. Fixed income supply/demand dynamics have shifted with the Fed asset purchases and collapse of the securitized products market during the crisis, at the same time that investor demand for fixed income has increased. Macroprudential measures and regulatory changes adopted in the aftermath of the crisis have required investors to hold more bonds. There is simply more demand for fixed income than available supply, which has driven valuations tighter and tighter as we see this year. As Fed taper talk began last year, the consensus was that this would be the worst year ever for the performance of bond markets. Who would have thought that US Treasuries would have outperformed the S&P 500 YTD or that EM sovereign frontier market debt would be the top performing asset across all markets, returning nearly 8%? Inflows into bond funds are now running even with inflows into equity funds, reversing last year’s massive outflows from bonds. We think that market participants will continue to be surprised at how much money is compelled to stay in fixed income. There will be many twists and turns for a fixed income analyst to watch in the years ahead that will keep us all very busy. Let me close by thanking all of you tonight for this wonderful honor. Thank you to the Fixed Income Analysts Society for such a special evening and for encouraging all of us in fixed income research to always aim higher, with intellectual rigor and a commitment to excellence. 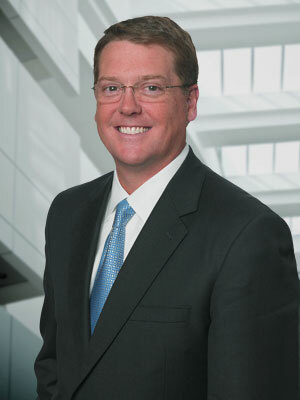 Curtis Arledge is Vice Chairman of BNY Mellon and Chief Executive Officer of Investment Management, which includes the company's asset management and wealth management businesses. Additionally, Curtis is a member of BNY Mellon's Executive Committee, which is the senior-most governing body of the corporation. Prior to joining BNY Mellon in November 2010, Curtis was the chief investment officer for fundamental fixed income portfolios at BlackRock, Inc. He joined BlackRock from Wachovia Corporation, where he was the global head of the fixed income division within the bank's corporate and investment banking group. He spent 12 years of his career at Wachovia, and had oversight for various business lines in the U.S., Europe and Asia, including leveraged finance, investment grade, global rates, structured products, corporate loan and commercial real estate portfolios, and financial institutions investment banking. From 1993 to 1996, Curtis was a founding member of Mariner Investment Group, specializing in fixed income arbitrage trading. From 1988 to 1993, he was a fixed income portfolio manager at BlackRock. A graduate of Princeton University, Curtis began his career as an analyst with Salomon Brothers in 1987. Curtis is a member of the U.S. Treasury Department's Treasury Borrowing Advisory Committee. He also serves as a director of Autism Speaks, the largest autism science and advocacy organization in the U.S.
BNY Mellon Asset Management is a leading global asset manager and in the top 10 in the U.S., with $1.6 trillion in assets under management. It is the umbrella organization for BNY Mellon's affiliated investment management firms and global distribution companies. Each investment management firm has its own proprietary investment processes, and focused investment approaches for specific markets and/or asset classes. Collectively, BNY Mellon Asset Management's boutiques represent a great breadth and depth of expertise in virtually every major asset class and sector. BNY Mellon Wealth Management, which ranks among the top 10 U.S. wealth managers with total client assets of more than $185 billion, provides wealth planning, investment management and banking services to individuals and families, family offices, and charitable gift programs through offices in 18 states and four countries. BNY Mellon is the corporate brand of The Bank of New York Mellon.